Truth by Kbaig: Internal Situation of India!!! On 26 December 2013, Mao freedom fighters killed whole convoy of Central Reserve Police of India in an ambush. These policemen were carrying relief goods for flood affectees of District Beejapur, on their way suddenly one of the vehicles of the police convoy was destroyed by a remote controlled bomb and rest of the policemen were killed by the freedom fighters. The fight continued for an hour however, Maoists succeeded in overpowering the policemen. In this ambush only three policemen were found alive in very critical condition; all others were killed by the Maoists and before leaving they took away weapons, ammunition and uniforms of the policemen. As soon as the reports of ambush were received, Indian Reserve Police sent more policemen to search the freedom fighters, in this search 7 unarmed innocent Indian citizens were killed by the police which later on proved to be 4 farmers and 3 other citizens. Indian media normally avoids giving coverage to activities of Mao and Naxal separatists, especially national newspapers of India try to suppress news of such attacks; in spite of this, reports of freedom fighters reach to the international media through local newspapers but due to control of Jews, international media also ignore these reports. However, there are some incidents that are so much serious that it becomes impossible to Indian govt., media and pro-Indian controllers of international media to suppress these news reports. For example on 25 May 2013, Naxalites targeted convoy of leaders of Indian National Congress in an ambush at Warbah Valley when they were returning after participating in a rally in District Chhattisgarh of Sikkim. This convoy had 26 vehicles carrying 200 persons including leaders and politicians as well as ministers of Congress; due to the presence of VIPs special security was also provided to the convoy but as convoy reached the narrow road in between the dense trees; the separatists that were waiting in ambush for the convoy targeted fourth vehicle of the convoy through remote controlled bomb. Blast was so much intense that four vehicles behind the targeted vehicle were burnt as well. In this ambush including Senior Provincial Minister Mehndra Karma, important leaders and provincial heads of Congress Nand Kumar Patel and Vidya Charan Chukla 27 important political figures were killed on the spot while others succumbed to injuries till 11 June 2013. Maoists accepted the responsibility of the attacked and claimed that they have achieved the goals of the ambush. Indian govt. arrested hundreds of innocent persons during search operation however, this mystery has not been resolved until now that how Maoists succeeded in achieving their targets despite of heavy deployment of security. Who pointed out the exact location and vehicle of the Provincial Minister and others; were the informers within the convoy or they were just keeping convoy under observation from a distance? On 25 June 2013, freedom fighters shot down a helicopter of Indian air force in Gauri Kund, an area of Uttar Khand. Indian air force told media that helicopter crashed due to technical fault but Maoists claimed that this was shot down by their gorillas. 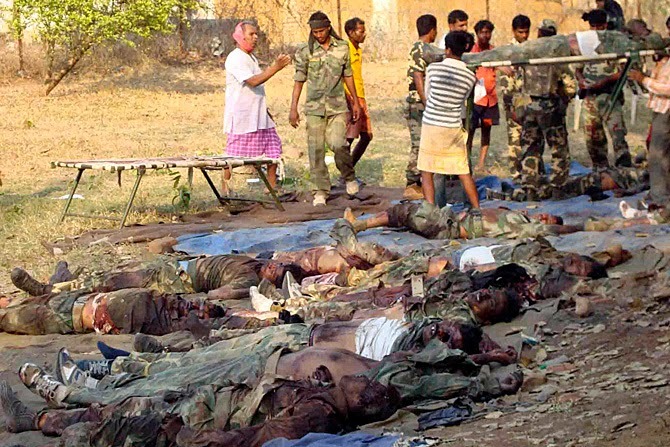 On 27 November 2013, 4 Indian soldiers were killed by Maoists in Chhattisgarh. 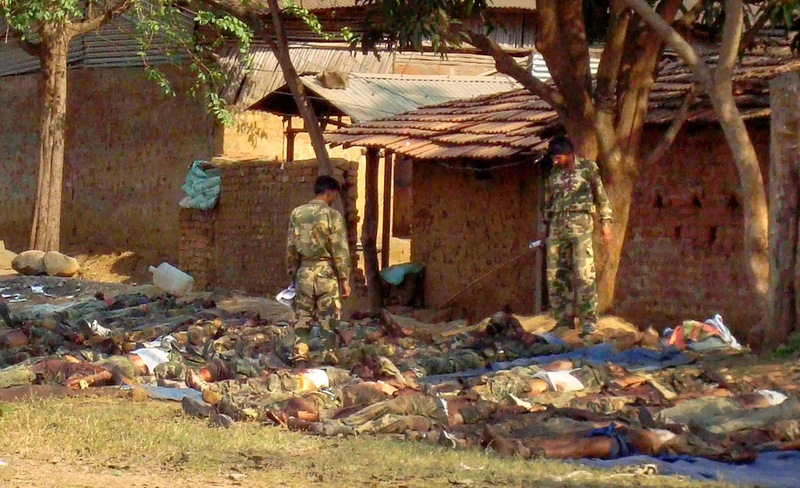 On 3 December 2013, 9 Indian soldiers were killed in a remote controlled bomb attack by Maoists in Indian province Bihar. I am sure that most people would be ignorant of the incident that occurred on 6 April 2010 in Chintalnar village of District Dante Wada, Chhattisgarh. 62nd Battalion of Indian Central Reserve Force (CRPF) was deployed there to search and destroy hideouts of Maoists. 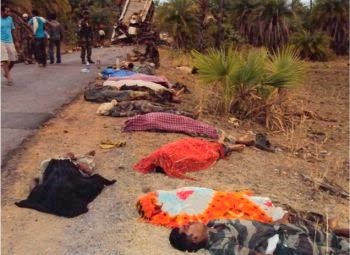 On the morning of 6 April 2010, at 6:45 am when whole battalion was sleeping along with the sentries deployed for its protection, 200 persons of Maoists attacked the base of the battalion; attack was so furious that sleeping soldiers could not even wake up to take their guns. According to CRPF 76 of its soldiers were killed in this attack but according to Maoists claims 150 soldiers were killed and whole battalion was wiped out. After wiping out the whole battalion Maoists took light and heavy guns, rocket launchers, ammunition, grenades etc. along with them. All the vehicles there were burnt as well. Indian govt. had to send in the APCs to recover the dead bodies. Indian security agencies failed to arrest or kill the Maoists however, Indian media was given reports after arresting innocent Indian citizens that suspects have been arrested and investigations are going on revealing useful information; results would be shared soon with media. 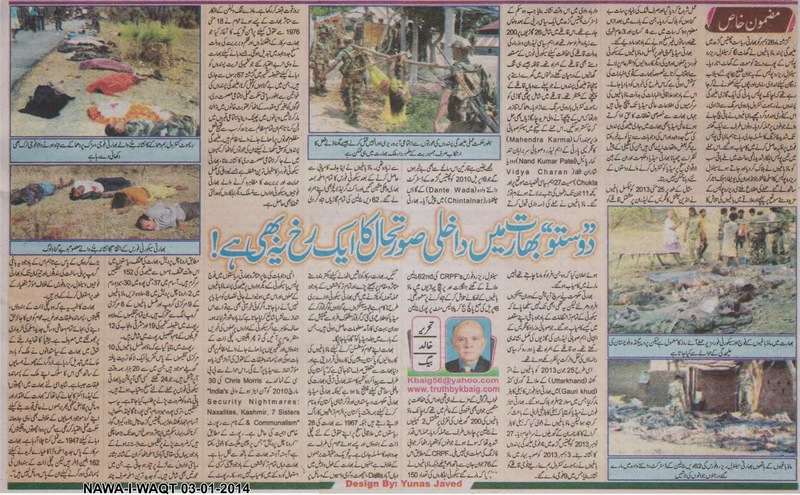 In order to satisfy her public; India blames Pakistan and China for activities of Maoists and freedom fighters and the world knows about the India only that “Kashmir dispute created by the Pakistan is the only hurdle in the development of India and challenge to existence of India because including Indian army, govt., bureaucracy and media is busy in propaganda against Pakistan”. On the other hand ground reality is that since 1967, Hindus from lower caste belonging to 28 Indian occupied states are struggling for freedom (on regional level) from slavery of Brahmans to procure their basic rights. This freedom struggle is against slavery of Brahmans who have taken over the resources of lower caste Hindus, Dalits and Adivasi’s by force. Being impressed by the thoughts of Mao Tse-tung and Lenin crushed and poor segments of India started a peaceful struggle for their rights which was later on converted into armed struggle because of the inhuman ways used to crush and suppress this struggle as India has been using in Indian Held Kashmir from last 67 years for example gang rapes of women of freedom fighters as a state policy to crush the freedom struggle, abduction of innocent people and inhuman treatment in torture cells, genocide and throwing away dead bodies in deserted areas or mass graves etc. Out of all these tortures and war crimes practiced by Indian state terrorists (Indian Army) the most shameful and worst is the abduction of innocent women and gang rapes with them at Indian army camps; the most shocking aspect is that Indian army is provided full protection against any legal trials by Indian state for these war crimes against women. 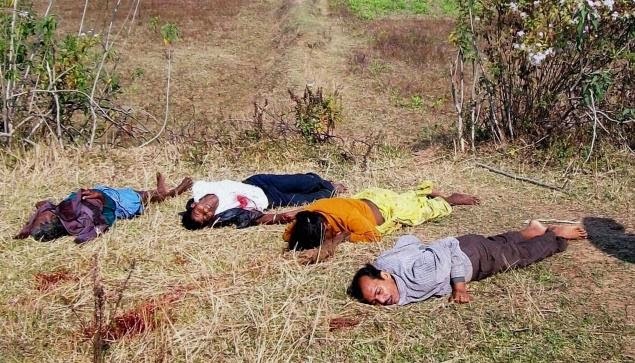 Due to these war crimes India does not allow reporting of killing of its security persons in skirmishes with Maoists, Naxalites or other freedom fighters if any news is inevitable to be published than it is published in such a way that it does not catch any attention. Of course if news of attacks over security forces are allowed to be telecasted or published than reasons for these attacks i.e. denial of basic human rights to lower caste Hindus, Dalits, Adivasi’s and minorities and inhuman treatment of these vulnerable segments of society by Hindu Brahmans would be discussed as well. In this regard the report of Chris Morris representative of BBC that was telecasted on 30 March 2010, “India’s Security Nightmares: Naxalites, Kashmir, 7 sister & Communism is of much importance. According to the report Arunachal Pradesh which China claims to be its part is silently slipping out of Indian hands. India has failed to stop use of Chinese currency despite of all of her efforts. Report states that including Arunachal Pradesh in whole India more than 152 freedom movements and organizations are active, out of which 37 are Assam, 30 in Manipur, 2 in Mizoram, 8 in Arunachal Pradesh, moreover 9 central groups of Maoists and 8 central groups of Naxalites are fighting separately. In addition to these freedom movements report includes 19 freedom movement in Indian Held Kashmir and 12 in Indian Punjab. According to the report 10 freedom movements or groups of Naxalites and Maoists only have more than 100 thousand trained gorillas out of which 20,000 are operational at a time and available to attack Indian security forces any time, others can be ordered on demand. 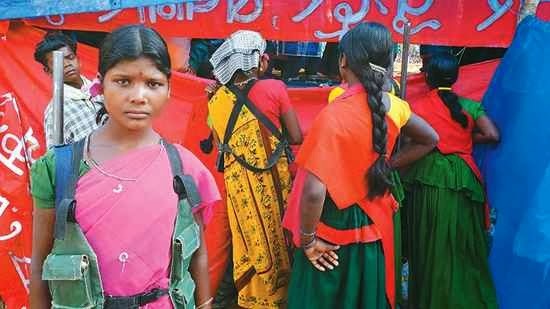 All these freedom movements have gathered so much influence in Tripura, Mizoram, Manipur, Nagaland, Meghalaya, Assam, Jharkhand, Orissa, Chhattisgarh, Tamil Nadu, Kerala, Goa, Karnataka, Bihar and Sikkim that local people including women not affiliated with any freedom movement get ready to take weapons against Indian army side by side the freedom fighters. Although modern weapons are available to few big groups only however these freedom fighters utilize old guns and even cross bows against Indian army in an effective way. The tragedy of India is that Brahmans or upper class Hindus are not ready to give basic rights to lower caste Hindus, Adivasis, Dalits and minorities of India but they are spending all of their resources to collect heap of modern weapons; India has been converted into a heap of dynamite in order to fulfill the dream of becoming boss of Asia, India treats its neighbors like Dalits as well. Perhaps this is why leader of lower castes Dr Kancha had to say, “a handful of Brahmans having control of Indian govt. and resources have adopted same aggressive policy for their neighboring countries which they have been practicing to crush poor and powerless segments of Indian society since 1947. India has 162 billion dollars to buy weapons but nothing to feed and resolve the problems of lower castes, minorities and poor segments of Indian society”. I have been following you for a long time, I appreciate your effort and the research work you have done, If possible can you share some views regarding 65 war, the basics.